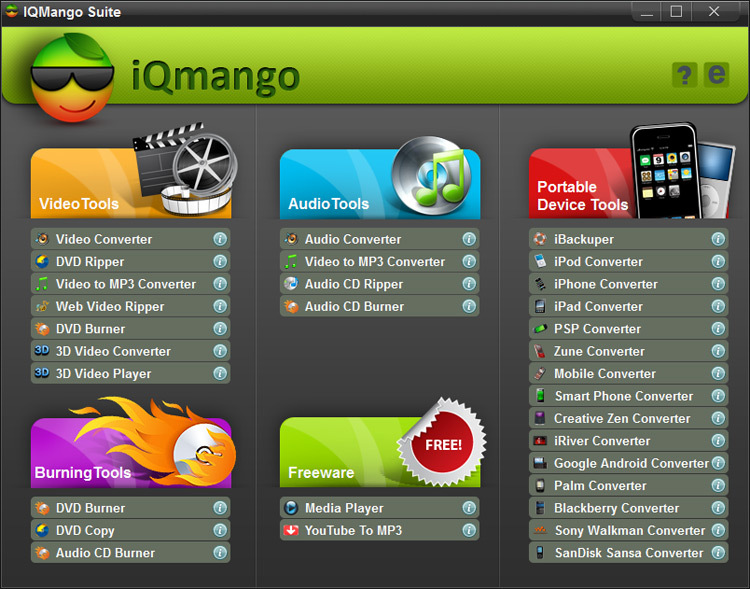 Download IQmango Pack of 31 free apps! Audio converters, video converters, CD burners, DVD burners, iPod/iPhone/iPad backup tools, portable device converters and more. Best quality. All 31 apps are FREE to download, install & use. Enjoy IQmango Pack! The amazing set of free multimedia tools include: Audio CD Burner, Audio Converter, Video Converter, 3D Video Player, 3D Video Converter, DVD Burner, iBackuper, DVD Ripper, Video to MP3 Converter, DVD Copy, iPad Converter, SanDisk Sansa Converter, iPhone Converter, Sony Walkman Converter, iPod Converter, Blackberry Converter, PSP Converter, Palm Converter, Zune Converter, Archos Converter, Mobile Converter, Android Converter, Smart Phone Converter, iRiver Converter, iBackuper, Creative Zen Converter, Audio CD Ripper and other free cool applications. With the vast functionality of IQmango Pack any user can achieve all the tasks necessary to satisfy their particular multimedia needs! Download and use IQmango Pack for absolutely free of charge! All the products are safe to use and virus free, so you don't have to worry about the safety of your system with IQmango Pack. Make use of the ultimate selection of free multimedia programs - download and install IQmango Pack right now! This site does not contain serial number, crack, keygen IQmango Pack serial number : serial number is the simplest type of crack. A serial number(cdkey,product key,etc) is register the program as you may already know. a crack or keygen may contain harmful software. If you cannot find the exact version you want, just give it a try. for more information read .nfo/.txt/.diz file include in zipped file.